These slow cooker seasoning blends make putting together delicious slow- and multi-cooker meals easier while giving back in a major way. Whether you’re feeling like something Mediterranean, Indian, or smoky southwestern, an all natural seasoning pack helps you get a tasty meal together, including an easy to follow recipe and shopping list. Made in the USA by a Certified B Corporation. Dimensions: Each: 5" x 1.5" x 7"
Southwest Fiesta (Salt-Free): Great for chicken tortilla soup, coffee cocoa brisket, and taco chili. Coq Au Vin (Salt-Free): Great for coq au vin, chicken & wild rice soup, artichoke chicken with capers, and French onion soup. Provençale (Salt-Free): Great for French beef stew, herbed dijon chicken, and sausage & white bean casserole. Mediterranean (Salt-Free): Great for Italian bean soup, balsamic sausages with mixed peppers, and Italian chicken sausage & white bean soup with escarole. Indian Dal: Great for lentil curries, curried cauliflower soup, and curried green lentil dip. Smoky BBQ: Great for classic pulled pork, smoky Turkish red lentil soup, or sticky chicken tacos. 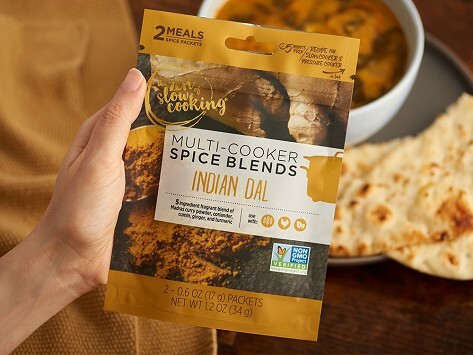 The Zen of Slow Cooking spice packets make crockpot meals easy & so very tasty! I really love the Coq Auq Vin &Provencale spice blends. The slow cooker seasoning packs from the zen of slow cooking combine the passions of Makers Meg Barnhart and Jane McKay. The duo head up the Certified B Corporation to streamline dinner prep and improve family time. They also want their all natural seasonings to give back beyond the weeknight dinnertime grind. Meg was inspired by her son, Doug, to find a way to create employment opportunities for people with developmental disabilities. So the slow- and multi-cooker seasoning packs are packaged by folks like Doug through a partnership with Planet Access Company in Illinois where the seasonings are made. She and Jane also wanted to include underserved communities in their slow-cooking mission. Their Drishti Donation gets people together to cook and enjoy a slow-cooked meal, complete with the cooker. Meg and Jane are careful about what goes into their seasonings, so the spices are all-natural and most blends don’t have any salt added. A shopping list and easy to follow recipe are on the back of the packs to make it even easier to get a hot and flavorful meal on the table.